BAUER POTTERY MATT CARLTON VERY RARE WHITE FLARED VASE! 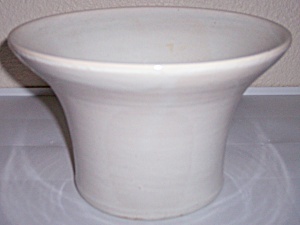 This is an offering for very rare example of a Bauer Pottery Matt Carlton wheel thrown gloss white glaze vase. It measures 6-1/8" tall and has a rim width of 9-3/4". It is the same shape that was used for the ruffled rim vases, before the ruffles were created. I have attached a picture of the interior of a jade ruffled rim vase to show the punch out ring on both pieces. Please reference examples of the ruffled rim pieces in Snyder's Beautiful Bauer book on page 136. This lovely piece does not show a hint of use on this piece and is without any nicks, chips, cracks or repairs. Shipping for this wonderful addition to your collection is $15.00.